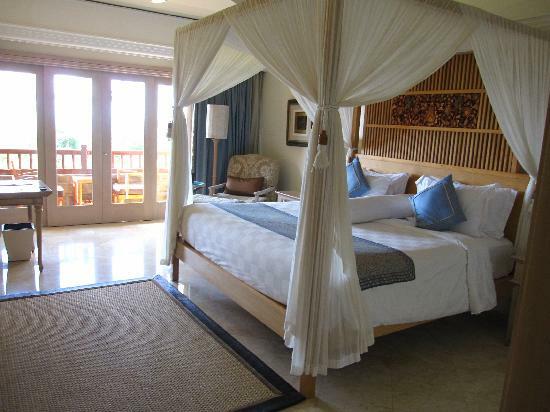 This photo of the Ayana Resort and Spa Room is from TripAdvisor. Most people we talked to were quite happy with the hotel rooms. They are more centrally located, and quite large. In fact I think that the hotel room guests got better value for their money. The one bedroom villas were mostly the same, just in different locations. We had breakfast included and enjoyed it in the Dava Restaurant every morning. If you choose to stay in a Villa you get the use of a Butler, which is always fun! They will provide you with a cell phone to use during your stay, to call the butler or front desk, or to use on the island. The butlers will pick you up in a golf cart and take you anywhere on the grounds. They will make dinner reservations, spa reservations, will call the cliffside pool to see if there is a bed available, or put you on the waiting list if it is not. You also have a plunge pool, that was freezing but would cool you off if you were hot! The gazebo was one of our favorite spots to hang out and relax in. As I mentioned earlier, we chose to stay in the villas. The Oceanfront villas were not available by the time we booked, so we chose an Ocean View Cliff villa. The villa itself is quiet nice, unfortunately however they are a little dated for what you are paying for. We had a one bedroom, with our own plunge pool, and verandah. In it's day, these villas would have been spectacular. However, we were moved 3 times during our one week stay. The first villa we were in was really close to the restaurnant, and a large group had live music going on. It was hard to hear ourselves think. So the next day they moved us to a villa closer to the Villa Lobby...much quieter. The second villa was quieter, however we had a real bug problem. I know we are in the tropics and need to expect that, however, every time there was anything sweet in the bathroom, including soap, we ended up with a thouand small bugs. We asked them to spray at least 3 times and they still came back. We know that it could be fixed, as our third villa didn't have any bugs at all. Our third villa was on ocean front. It was beautiful, we had a great view of the ocean, and a huge lawn to the cliff. We didn't have any bugs, but we did have a smell in the toilet area. Like I said, When this property was a Ritz Carlton, you could see how it was amazing. Some refurbishments, and bug problems are required for the price we paid. If the price was lower, we would probably have put up with more and chalked it up to experience. See more ideas for Bali vacations . If you have visited this Bali Hotel before, please comment below we would love to hear your review and experience of it!